A few months ago I was asked by a friend if I’d like to tag along and help him record some source audio for the sound design of a video game. 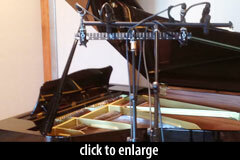 Never one to shrink from a challenge (or a chance to record classical music in a new way) I was happy to have an interesting task, especially since I had a pair of Microtech Gefell M 221s sitting on my desk. Needless to say, I was interested in how these precision measurement microphones would fare on a recording of overly boisterous piano music for a gitchy iOS game. 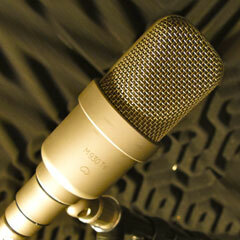 For comparison, we used the most-similar mic pair we had on hand, DPA 4041-S (in the 3532-S stereo kit). The 4041 has a 1-inch diaphragm, roughly twice the size of the 13mm diaphragm in the MTG 221. This is therefore not the most perfect comparison. I’d have preferred to use DPA 4003s for a more close match. However, these mics’ specifications otherwise match up close enough to make the comparison fair. The source was a Yamaha Conservatory C3 piano, playing Chopin’s Polonaise No. 6 “Heroic” Op.53/F (originally performed by Stanislov Bunin). First, just a bit of background on the extremely capable Gefells. The M 221 is an omnidirectional condenser microphone which finds its heritage in Gefell’s original MK221 capsule design, which is also found in the Josephson c617 Set, an omnidirectional condenser of equally high quality. The M 221 brings together this small diaphragm measurement capsule with a modular preamplifier that is ideally suited to varying environments. The 2 micron nickel diaphragm is polarized at 200V by the M221 circuit, and other half-inch capsules can also be used with the M 221 head amplifier. The published frequency response of the M 221 is nominally flat from 20Hz–20kHz, with less than 1dB variation in the high frequencies. 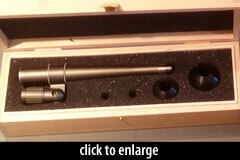 Gefell ships the M 221 in an attractive wooden box and includes the MH93.1 microphone holder and both the KA 3 and KA 4 spherical acoustic equalizers. The KA 3 and KA 4 are used to accentuate high-end frequency response and slid onto the neck of the microphone upon removal of the capsule. The KA 3 is 30mm rubber sphere and provides a 3dB boost from 4kHz–12kHz. 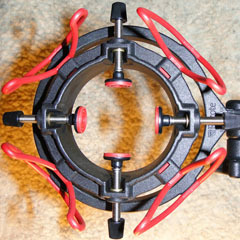 The KA 4, a 40mm sphere, provides a 3dB boost from 1kHz–12kHz. As I mentioned, my source for the M 221s was piano, so I decided to try them in a slightly spaced configuration with the 4041s as close as possible for comparison. I generally don’t get too excited about omnidirectional condensers, however what struck me was the painful accuracy of the mics’ frequency response. On any given day, my “go to” mic for piano would be something slightly more colored like the Schoeps MK2H (just my preference). Thus, upon placing the pair in my typical spaced-pair location I found the result less than desirable and had to make a great number of adjustments to get used to this extremely flat microphone. So, how did the M 221s sound? Below are two short excerpts from the session, the first recorded with the Gefell M 221s and the second with the DPA 4041s. Granted, this clip sounds rather mechanical (the source being non-human) and hysterically boisterous (it works in context, I swear. Think hokey game! ), however I was quite pleased with the M221s performance. In comparison with the DPAs, the Gefells exhibited more accurate and crisp highs along with more detailed and less flabby lows. The difference is subtle, but I definitely preferred the M 221s in application. Because of their extreme accuracy, I’d have no problem recommending them to someone who works in a wide variety or environments or with a diverse clientele. Though I spent only a short time with the Gefells, I truly believe the pair would be an asset to most any mic closet. Given the level of detail they easily captured, I can easily imagine them handling small and large ensembles, percussion, brass, and especially strings with ease. The Microtech Gefell M 221 possess a unique sonic characteristic best classified as delicate transparency, showcasing the best of any instrument while not getting in the way, and that is certainly a quality worthy of a spot on all our shelves. It was a little hard to tell because, frankly, the piano wasn’t the greatest, but I liked the DPAs better when listening with headphones. I’m wondering about your mic placement for omni mics. I don’t have any experience using them for piano. Why did you place them where you did? The DPA mikes were clearly better.The sound quality was more solid and natural. Anyone with a decent pair of ears would agree. IMHO the test setup is not suitable for a fair comparison. The M221 is extremely neutral and will make audible a mediocre room immediately. 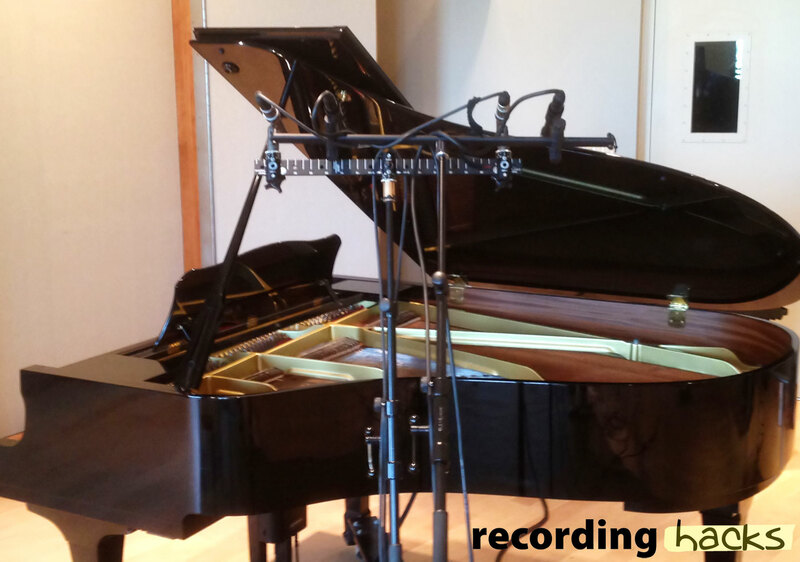 Piano recordings of the repertoire usually take place in concert halls, for some good reasons. The M221 also reacts incredibly sensible to changements of the mic position, you will be able to hear a 5 cm (2 inch) move easily. The mic positions in the example are not the same at all.